The most popular flower grown in the U.S., impatiens flowers are bright and cheerful annuals that can light up any dark and shady part of your yard and growing them is quite easy. 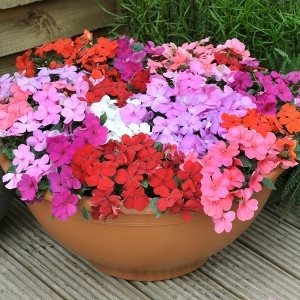 They can be used as bedding plants, border plants or in containers as well as making beautiful hanging baskets. When done in mass plantings, they make quite the colorful impact. They enjoy moist but well-draining soil and partial to deep shade. They do not do as well in full sun, but if you would like to plant them in full sun, they will need to be acclimated to the harsher light. You can do this by exposing the impatiens plants to increasing amount of sunlight over the course of a week. Impatiens do best if fertilized regularly. Use water-soluble fertilizer on them every two weeks through spring and summer. You can also use slow release fertilizer at the beginning of the spring season and once more half way through summer. Impatiens do not need to be deadheaded. They self-clean their spent blooms and will bloom well-draining long.